The Salzburger Lokalbahn standard gauge electric line runs from Salzburg to Lamprechtshausen (25km), with a branch from branch from Bürmoos to Trimmelkam (9km). The first service ran in 1886 with the extension to Lamprechtshausen opening in 1896. 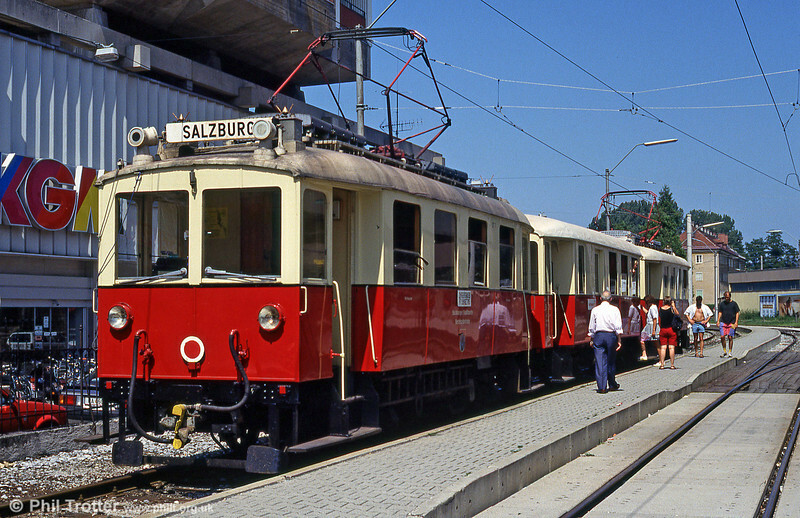 After the war, the Salzburger Lokalbahn had to start again from scratch, with existing vehicles upgraded. Electrification to Lamprechtshausen completed in 1950. Vintage Salzburg Lokalbahn car ET7 - built by MAN in 1907 - at Salzburg Lokalbahnhof on 9th August 1992.